When Mauricio Macri became the new President of Argentina, his administration decided to shut down several pet projects of his predecessor, Christina Fernandez de Kirchner. One particular division is an Argentinian UFO agency. In May 2011, Fernandez de Kirchner started the Commission for the Study of Aerospace Phenomena or CEFAE, which hired civilian and military experts. 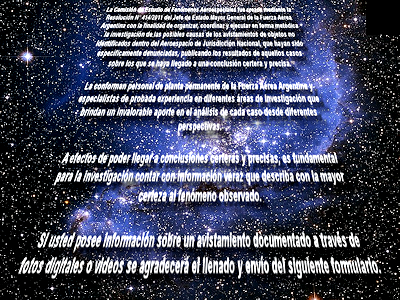 The new agency had the objective of getting more details about several UFO sightings in Argentina. However, the agency’s almost five-year existence only came up with one report and 10 investigated UFO sightings. The one and only study consisted of 12 pages and concluded that nine out of 10 sightings actually involved a bird, soccer ball, helicopter, red lights of an antenna, a star, airplane, Jupiter, the moon and a combination of a star, satellite and NASA’s International Space Station. The 10th case was not resolved because the witness failed to provide a photo or video. However, the study stated that it may be a red laser being shown on a wall. The CEFAE was also linked to the San Martin National University (UNSM), which public officials allegedly used for personal gain. During Kirchner's time, the school reportedly came up with a degree in aerospace engineering. It was believed, however, that the $15 million in funding the division was actually used to pay party activists and cronies. Argentina: NASA To Look Into Rio Cuarto UFO?